Forget about the PISA results that show how poorly American 15-year-olds do against students in other countries when solving real-world problems in math, reading and science. What about the Millennials? According to new analysis by testing company ETS, this generation of adults born after 1980 demonstrate "weak skills" in literacy, numeracy and technology problem solving — in spite of having more years of schooling than all other previous generations. "America's Skills Challenge: Millennials and the Future" actually examines data from a couple of years ago that came out of the Programme for the International Assessment of Adult Competencies (PIAAC) to compare the United States to 21 other member countries in the Organisation for Economic Cooperation and Development (OECD). Millennials aren't testing as well as they did in the last decade. 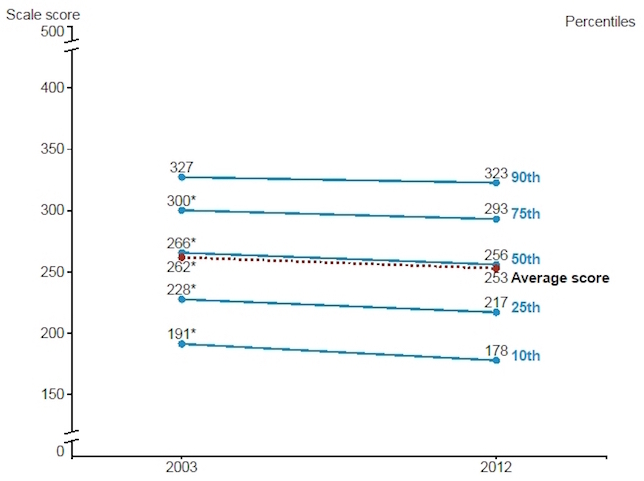 Trend in average scores and percentile scores on the Adult Literacy and Lifeskills (ALL) Survey (2003-2008) and PIAAC numeracy scale (2012) for U.S. adults ages 16 to 65. The problem with the results, said ETS researchers Madeline Goodman, Anita Sands and Richard Coley are that these individuals, who were 16 to 34 years old at the time of the testing, "will shape the economic and social landscape of our country for many years to come." The average scores for U.S. millennials were lower than in many other countries and ranked at the bottom in numeracy and "problem solving in a technology-rich environment (PS-TRE)." The youngest segment — 16- to 24-year-olds — ranked dead last in numeracy and among the bottom countries in PS-TRE. In literacy, U.S. millennials scored lower than 15 of the 22 participating countries. 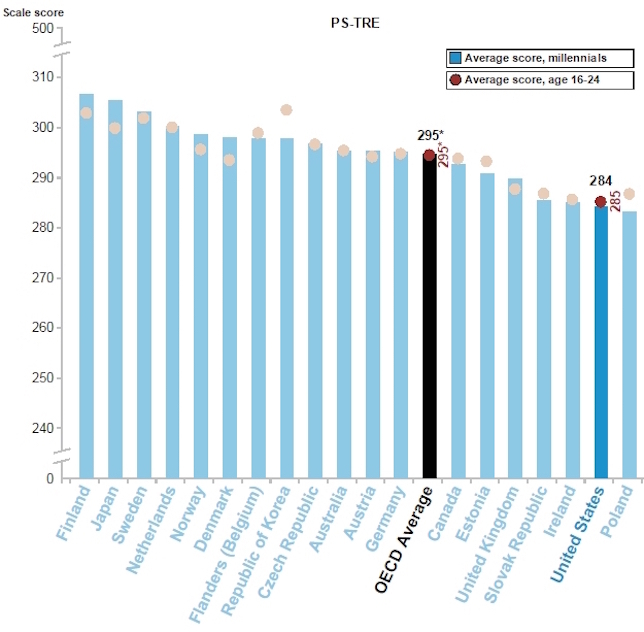 Only test-takers in Spain and Italy had lower scores. In PS-TRE, American's ranked last, along with the Slovak Republic, Ireland and Poland. Native born millennials with the greatest economic advantage didn't set themselves apart compared to their international peers. In numeracy, for example, the top performing test-takers came in with lower scores than the top-performing millennials in 15 of the 22 participating countries. Want to Try out PIAAC? OECD makes sample items from the PIAAC surveys available to the public. Even our most educated individuals aren't so smart. 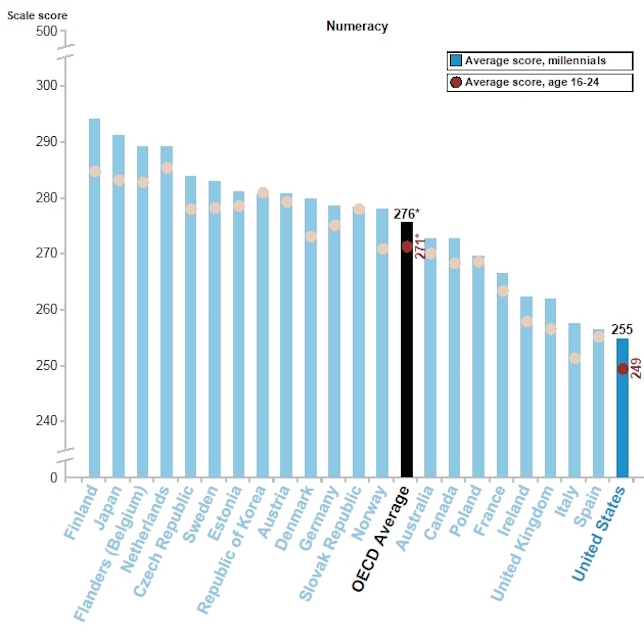 The only countries that American test-takers with a four-year bachelor's degree beat in numeracy were Poland and Spain. Individuals with a master's or research degree only scored higher than peers in three countries. U.S. millennials whose highest level of education ended with high school (or less) came through with scores lower than those of their counterparts in almost every other participating country. "While it is true that, on average, the more years of schooling one completes, the more skills one acquires, this report suggests that far too many are graduating high school and completing postsecondary educational programs without receiving adequate skills," reported Irwin Kirsch, director of ETS' Center for Global Assessment. "If we expect to have a better educated population and a more competitive workforce, policymakers and other stakeholders will need to shift the conversation from one of educational attainment to one that acknowledges the growing importance of skills." 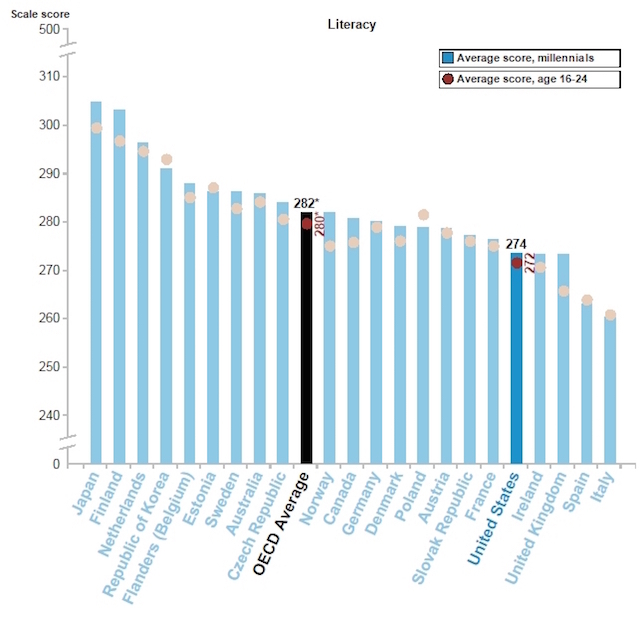 Average scores on the PIAAC literacy, numeracy, and PS-TRE tests for adults ages 16 to 34 (millennials) and adults age 16–24, by participating country or region. Source: OECD Programme for the International Assessment of Adult Competencies (PIAAC), 2012. The researchers noted that the findings deliver a "clear caution" about pinning education policy goals on years of schooling or the conferral of credentials and certificates. "This report suggests that far too many are graduating high school and completing postsecondary educational programs without receiving adequate skills," the report stated. "If we expect to have a better educated population and a more competitive workforce, policy makers and other stakeholders will need to shift the conversation from one of educational attainment to one that acknowledges the growing importance of skills and examines these more critically." Demands for more educated workers, may actually need to be translated to, "a demand for workers with 'very high levels of education' and perhaps very particular kinds of education and technical expertise."